Lee Miller, Edward Matthews as St Ignatius, Four Saints in Three Acts c. 1933 © Lee Miller Archives, England 2017. All rights reserved. The Photographers’ Gallery presents 4 Saints in 3 Acts - A Snapshot of the American Avant-garde. 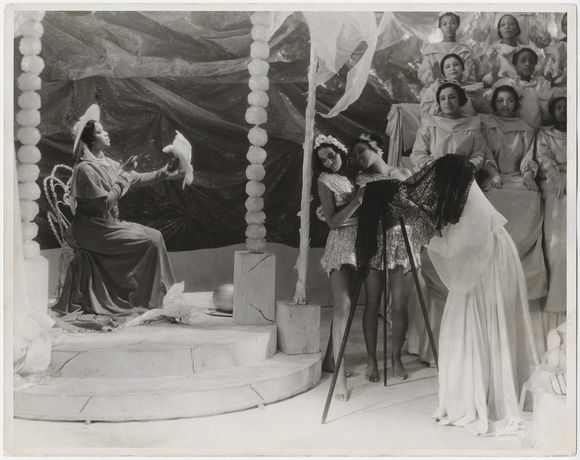 It is the first exhibition worldwide to focus on the photographic dimensions of the ground-breaking American modernist opera, Four Saints in Three Acts. With a libretto by Gertrude Stein and a score by Virgil Thomson, the opera premièred at the Wadsworth Athenaeum in Hartford, Connecticut (to mark the opening of Pablo Picasso’s first solo exhibition in America), and subsequently transferred to Broadway, as the first opera to open there, on 20th February 1934. Defying the form and content of traditional opera, bringing together some of the leading names in performance, design and photography and featuring an all African-American cast, Four Saints came to epitomise a unique experimental moment and was considered a seminal work of the trans-Atlantic American avant-garde. Photography played a central role in the productions’ development, creative process and documentation and this exhibition brings together over 80 photographs, from cast portraits to stage and behind-the-scenes shots and includes previously unseen work from such leading photographers as Lee Miller, Carl Van Vechten, George Platt Lynes and Thérèse Bonney. The production further boasted choreography by Frederick Ashton and strikingly innovative cellophane stage designs from surrealist artist Florine Stettheimer and reflected a complex interdisciplinary intersection of white and black, queer and straight, avant-garde and mainstream subcultures. 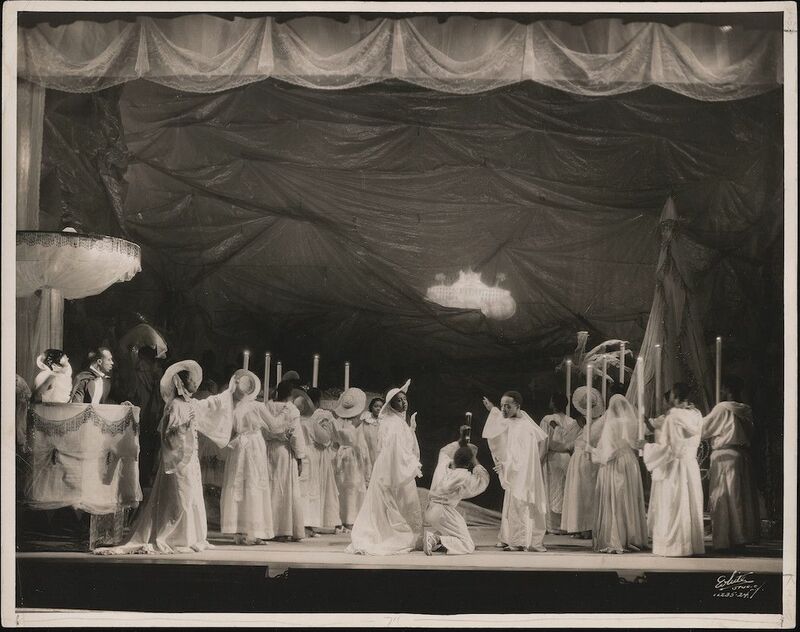 A crucial element of the success of Four Saints in Three Acts was the ground- breaking employment of an all African-American cast, recruited from the choirs and nightclubs of Harlem and coordinated by choir director Eva Jessye to perform Stein’s demanding text. 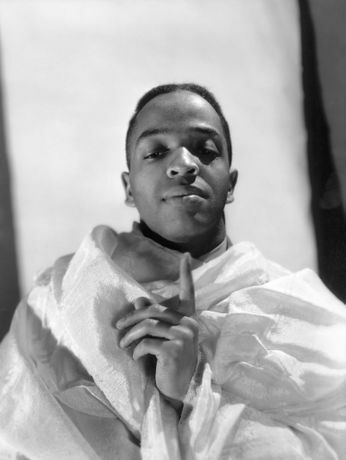 The portraits of Jessye and several cast members by Miller and Van Vechten in particular offer unique glimpses of a largely unknown community of Harlem-based classical music performers. They afford insights into the importance of the African-American contribution to the opera’s popular success. A number of the cast, for example, then went on to star in Gershwin’s Porgy and Bess in 1935, which was inspired by the original Four Saints in Three Acts production. Curated by Patricia Allmer (Senior Lecturer in Art History at the University of Edinburgh) and John Sears (Freelance writer and curator).